101 Stories of Hope, Healing, and Hard Work. Whether you are recovering from a traumatic brain injury or supporting someone with a TBI, this collection of 101 inspiring and encouraging stories by others like you will uplift and encourage you on your healing journey. With a traumatic brain injury (TBI) occurring every 18.5 seconds in this country – concussions the most common – chances are you have been touched in some way by this experience. TBIs occur due to accidents and sports, and are also common in returning soldiers. 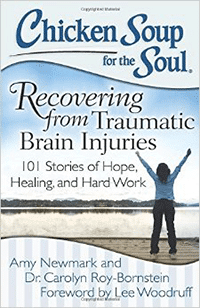 The personal stories in this book, by TBI survivors and those who love and support them, will help and encourage you and your family on your road to recovery.